As I have talked about before we eat a lot of beans in our house. I love that beans can be used in so many different ways and that they are a great source of protein. It doesn't hurt that they are also inexpensive and make for numerous leftovers. When I first met my husband he had really only eaten pinto and black beans. 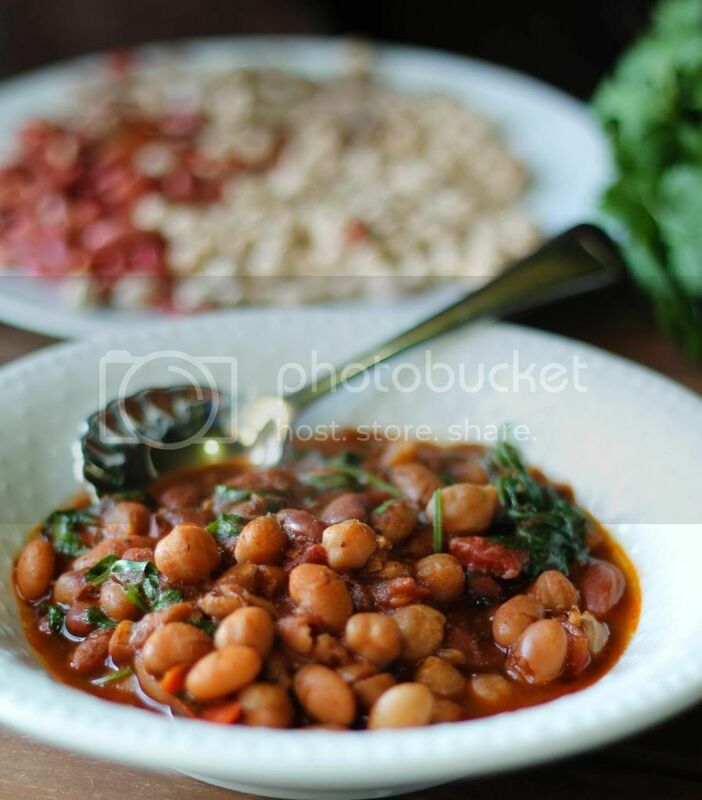 Pinto beans are very popular in West Virginia and almost any home cook has a recipe. Having grown-up in Seattle I had never really made anything other than chickpeas and kidney beans in vegetarian chili. Luckily after we got married I learned that there are a vast array of beans that can be used in so many different recipes. One of my favorite ways to prepare beans is stewed, it is easy and delicious. Last week I tried a new recipe for Stewed Beans from issue Number 152 of Saveur magazine, which looked like a great vegetarian meal option. This recipe has 17 ingredients. It takes 2 hours of total time, 30 minutes of which is active and makes 10-12 servings. I had no problems finding any of the ingredients at my local grocery store. I did adjust some of the cooking times on the recipe. I cooked the onion mixture for a full twenty minutes to ensure that the onions fully caramelized before adding the spices. Additionally, my total cooking time was 1/2 hour longer than suggested. I tasted the beans as the recipe was written and I felt that the chickpeas needed a longer cooking time so I put them back on the stove for an additional 30 minutes. Finally, this recipe will need a lot of salt added once it is completed. The flavor is delicious, but it definitely needs salt to bring out the flavors fully. I followed the remainder of the recipe as written. While this recipe takes a bit of planning and cooking time the results were worth the time spent. The beans were very flavorful and my whole family, including my two boys enjoyed them. My husband added hot sauce to his serving and it really did make the beans taste even better. I would suggest this addition if you like spicier foods as it really did bring out the taste of the beans. Overall a great vegan recipe full of protein and makes enough for multiple meals. For the recipe go to Stewed Beans. I love beans too, but unfortunately, my family does not like them. This looks so tasty! I love beans. I will eat them any way that I can get them. I wish my family felt the same way about them. I am definitely going to bring this to the table. I think my husband might actually love beans more than me :) We eat a lot of beans in our house! Good luck getting your family to eat more beans! Beans are such a well-rounded food. I wish my hubby would eat them so I could make them more for our fam! Thanks so much for linking up with MMM! Newest follower here! Awesome! I have 2 bags of pinto beans and didn't know what to do with them..